In 1919 Youmans worked as the pianist assisting Victor Herbert in rehearsing singers, which he sites as an incredible learning experience. He wrote his first Broadway show in 1921 with young Ira Gershwin, Two Little Girls in Blue. By 1924 he enjoyed enormous success with No, No Nanette, which became the first Broadway show to tour the world, and produced “I Want to Be Happy” and “Tea for Two” with Irving Caesar’s lyrics. In 1927 Leo Robin and Clifford Grey added lyrics to “Hallelujah” for Hit the Deck. The show also featured “Sometimes I’m Happy,” a song from a failed 1925 show, given new lyrics by Irving Caesar. 1929’s Great Day! produced “More Than You Know” and “Without a Song” with Billy Rose and Edward Eliscu. 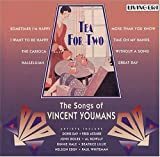 Two of Youmans’ most beautiful songs are “Time on My Hands” (1930), written with Harold Adamson and Mack Gordon, and “Through the Years” (1932), written with Edward Heyman. In 1933 he scored the film Flying Down to Rio, with its lively title cut, “Orchids in the Moonlight,” and “Carioca,” lyrics by Gus Kahn and Eliscu. Youmans contracted tuberculosis, but he loved the night life and did not slow down, contributing to his early demise. His output was small, but each tune was expertly crafted.